Who is More of a Threat: Far-Right or Muslim Extremists? A pattern of white supremacist-related killings has provoked discussion about the definition of terrorism, and dangers to the public. Conversely, no refugees hailing from any of the countries included in Trump’s Muslim ban have ever killed any Americans. This is an interesting set of claims, and reflects a wave of news articles and analyses in 2017 that compared the threat from Muslim extremism and Middle Eastern refugees with that from right-wing and white nationalist violent extremism. Far more attention in recent years has been given to the threat of homegrown radical Islamic terror — a danger that has generated such horrific acts as the Orlando and San Bernardino shooting sprees. Yet the very real specter of radical Islamic terror in the United States has existed alongside an equally serious threat of terror from right-wing extremist groups and individuals. Both movements have generated shooting sprees, bombings, and a wide variety of plots and conspiracies. Both pose threats so significant that to ignore either would be to invite tragedy. There a few problems with the Resistance Report article published on 27 May 2017, but it provides a helpful platform to take a proper look at some of the issues surrounding violent extremism of various kinds, and measuring its impact in human lives. A 2016 study by the conservative-leaning think tank the Cato Institute found that between 1975 and 2015, some twenty ndividuals who entered the U.S. as refugees had attempted or carried out a terrorist attack. Of the 3,252,493 refugees admitted from 1975 to the end of 2015, 20 were terrorists, which amounted to 0.00062 percent of the total. In other words, one terrorist entered as a refugee for every 162,625 refugees who were not terrorists. Refugees were not very successful at killing Americans in terrorist attacks. Of the 20, only three were successful in their attacks, killing a total of three people and imposing a total human cost of $45 million, or $13.84 per refugee visa issued. The three refugee terrorists were Cubans who committed their attacks in the 1970s and were admitted before the Refugee Act of 1980 created the modern rigorous refugee-screening procedures currently in place. The Resistance Report article cites a number of recent killings involving white suspects, where racism, xenophobia or Islamophobia appear to have been motivating factors. However, the ethnicity of a perpetrator can sometimes be a tricky matter. Consider the 2012 death of Trayvon Martin, a black teenager, in Sanford, Florida. That shooting, and George Zimmerman’s subsequent acquittal on second-degree murder charges, sparked a wave of protests and public debate about violence against young black men, and the Justice Department opened a federal hate crime investigation into the killing, before closing the case without bringing civil rights charges against Zimmerman. The racial dynamic in the killing and the subsequent trial was complicated by the fact that Zimmerman identifies as Hispanic through his mother, who was born in Peru. Although “Hispanic” is an ethnic designation rather than a racial one, it underlines the complexity of applying a strict and straightforward racial dynamic to some acts of violence. Similarly, the race, ethnicity or religion of a victim of violence can sometimes belie the racial, ethnic and religious dynamics at play in an attack. For example, Jeremy Christian is accused of killing Ricky John Best and Taliesin Myrddin Namkai Meche on 26 May 2017, after they intervened when Christian was, according to a prosecutor’s affidavit, directing a barrage of Islamophobic abuse and threats at two African-American teenagers on a Portland, Oregon train. The deceased in this attack are two white men, as is the suspect, but it would be difficult to argue that there was not a significant racial and Islamophobic dimension to the crime, based on the prosecutor’s affidavit, which was in turn gathered from police and witness statements. And finally, individuals who are white can engage in violent extremism that is not motivated by white supremacism or antipathy towards racial, ethnic or religious minorities. Consider, for example: the 1970s bombing campaign of the Weather Underground, a far-left militant organization led predominately by middle-class white men and women; the history of violent attacks on abortion providers; and violence motivated by animal rights and environmentalism. Then there are converts to Islam who become radicalized and engage in violent Muslim extremism, the most prominent example being Adam Gadahn, a white American of Jewish heritage, raised a Christian, who converted to Islam and became a senior figure in Al-Qaeda before being killed in a 2015 U.S. drone strike near the Pakistan-Afghanistan border. It should be noted here, though, that anti-Semitism and homophobia have been motivating factors in both Muslim and far-right extremist violence. 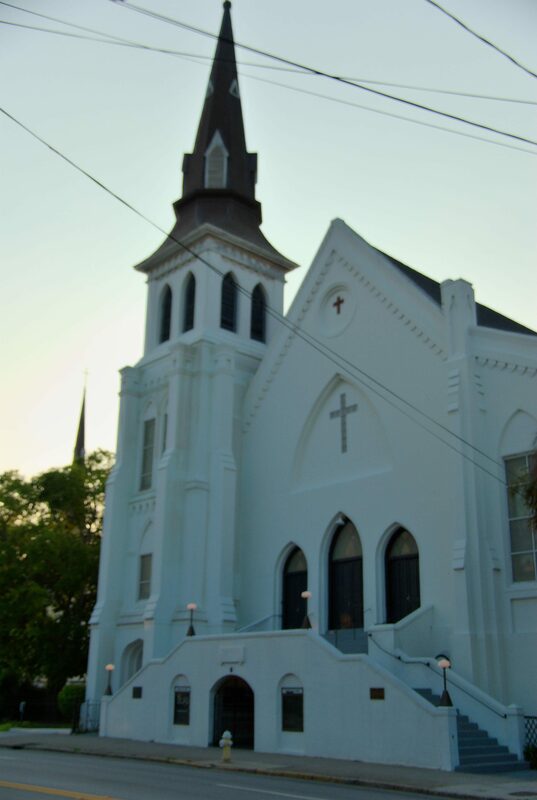 The Emanuel AME Church in Charleston, South Carolina, site of a 2015 massacre by white supremacist Dylann Roof. According to a major report published by the Government Accountability Office in April 2017, there were 62 fatal “far-right violent extremist-motivated attacks” leading to 106 deaths between 12 September 2001 and 31 December 2016. The most lethal of these, according to the report, was white supremacist Dylann Roof’s June 2015 shooting massacre at the American Emanuel AME Church in Charleston, South Carolina, which killed nine people. According to START (the University of Maryland’s National Consortium for the Study of Terrorism and Responses to Terrorism), there were 81 fatal far-right extremist attacks in the U.S. between 12 September 2001 and 31 December 2014, leading to 131 deaths. Remember that the Cato Institute report found that over a far longer time period (1975-2015), people who arrived in the country as refugees had attempted or carried out 20 terrorist attacks, killing a total of three people. So the data clearly shows that fatal attacks by far-right extremists are several dozens of times more common than terrorist attacks by refugees. Remember, too, that the only refugee-led attacks to have been fatal were carried out by anti-Castro Cubans, not Muslim extremists. When Collins said “No”, Urbanski reportedly stabbed him in the chest. Gordon Johnson, Special Agent in Charge of the FBI’s Baltimore field office, said the Bureau would be assisting in the investigation to see whether the killing might rise to the level of a hate crime — that is, whether it was motivated by racial bias. According to the Baltimore Sun, some witnesses also told police that Urbanski appeared “intoxicated and incoherent” at the time of the attack. Urbanski appears to have at least some association with an online far-right extremist group, but as of June 2017, it had not been established that racism was a motivating factor in the killing of Richard Collins, and that aspect of the investigation was still underway. The second incident highlighted in the Resistance Report article is the fatal stabbing of Ricky John Best and Taliesin Myrddin Namkai Meche on a Portland train on 26 May 2017. Both victims were white, like the suspect, and while a prosecutor’s affidavit said Christian had been engaging in racial and Islamophobic abuse on the train, the affidavit also describes a physical confrontation between Christian and three other men in the immediate run-up to the stabbings. It’s even less clear whether this attack would reasonably qualify as terrorism. This is perhaps the most difficult part of the Resistance Report article, which refers to “white terrorists”, and touches on a sometimes intense debate about what does and doesn’t qualify as terrorism. ….The unlawful use of force and violence against persons or property to intimidate or coerce a government, the civilian population, or any segment thereof, in furtherance of political or social objectives. Any activity that involves an act that is dangerous to human life or potentially destructive to critical infrastructure or key resources, and is a violation of the criminal laws of the United States or of any state or other subdivision of the United States and appears to be intended to intimidate or coerce a civilian population to influence the policy of a government by intimidation or coercion, or to affect the conduct of a government by mass destruction, assassination, or kidnapping. The unlawful use or threat of violence especially against the state or the public as a politically motivated means of attack or coercion. What’s common to these definitions is a political dimension, in the broader sense of that word. To be labelled terrorism, an act has to be engaged in a direct way with public affairs. It must be motivated by advancing some cause, bringing attention to it by deliberately creating a spectacle, disrupting government, changing policy, or creating fear so as to influence political decisions or change behavior. Under these definitions, at least, it does not appear sufficient for an act to be merely motivated by hatred or prejudice against individuals of a certain race, ethnicity, religion, or sexual orientation — a motive that amounts, legally speaking, to a hate crime. Often, terrorist acts are not motivated by any prejudice or hatred towards any societal group. For example, the far-left Weather Underground group targeted strategically important government, military and police buildings — but not specific social groups — in a wave of bombings during the 1970s. The line between terrorism and hate crime can be blurry and elusive. Take, for example, the case of James Harris Jackson, a white resident of Baltimore, Maryland, who told police he had travelled to New York City on 17 March 2017 for the specific purpose of killing black men. Three days after he arrived, Jackson stabbed 66-year-old Timothy Caughman to death with a sword on a street corner in the Chelsea neighborhood of Manhattan before turning himself into police later that night and confessing to the murder. [Jackson] chose Midtown as his crime scene because Manhattan is the media capital of the world, and a place where people of different races live together and love one another. Jackson’s crime, as well as being racially motivated, was intended for public consumption. However, other crimes which appear to more closely meet these criteria for terrorism do not end up carrying such charges. For example, Dylann Roof wrote white supremacist manifestoes both before and after he shot to death nine black congregants at the American Emmanuel AME Church in Charleston, South Carolina in June 2015, later saying that he committed the crime in the hope of sparking a race war. This was clearly a massacre that was intended for public consumption, planned to create a spectacle, motivated by a racist ideology, and perpetrated in the hope of encouraging others to do likewise — all descriptions that would appear to meet the “terrorism” criteria applied in the case of James Harris Jackson. However, Roof was not charged with terrorism, but rather was charged in federal court — and convicted — of several hate crimes, including “obstruction of exercise of religion resulting in death” and “use of a firearm to commit murder during and in relation to his hate crimes,” among others. Prosecutors sometimes avoid terrorism charges, not because they are inappropriate to a crime, but because they can be difficult to prosecute and require significant resources, or because existing charges are already likely to carry life sentences or the death penalty and the addition of terrorism charges would not increase the punishment for a crime. With those problems of definition in mind, here are some numbers comparing violent far-right extremism (or far-right terrorism, if you prefer) with violent Muslim extremism (or Islamic terrorism, if you prefer). Between 12 September 2001 and 31 December 2016, there were 23 fatal “Radical Islamist Violent Extremist-Motivated Attacks,” resulting in a total of 119 deaths in the United States. In the same time period, there were 62 fatal “far-right violent extremist-motivated attacks”, leading to 106 deaths. Just two events account for more than half of the 119 deaths resulting from Muslim extremist attacks: the December 2015 San Bernardino attack, which killed 14 people, and the June 2016 Pulse night club attack, which killed 49 people. According to the University of Maryland’s START consortium, between 12 September 2001 and 2016 there were 31 fatal “Islamist extremist” attacks, leading to 119 deaths. In the same time period, there were 89 “far-right extremist” attacks, resulting in a total of 158 deaths. So both data sources agree that far-right extremist attacks are far more common, but they differ on the total number of deaths, with one source concluding that Muslim extremist violence has killed slightly more people (119 deaths, as opposed to 106), and another concluding that far-right extremist violence has killed significantly more (158 deaths, as opposed to 119). According to START, Muslim extremist violence killed seven times more people than far-right extremist violence between 1990 and 2016, despite five times fewer fatal attacks. However, this period included the 1995 Oklahoma City bombing and the attacks of 11 September 2001, the two deadliest terrorist incidents in American history. When those outliers are removed from the figures, according to START, far-right extremist violence caused 272 deaths between 1990 and 2016 — more than twice as many as the 130 deaths from Islamic extremism during the same period. So whether Muslim or far-right extremists have killed more Americans depends on how you measure such incidents and which source you use. And sorting through attacks and placing them in the categories of “terrorism”, “violent extremism” or “hate crimes” can sometimes be extremely complicated. But when it comes to extremist violence perpetrated by refugees, the numbers are unequivocal. In the four decades between 1975 and 2015, only 20 individuals who arrived in the U.S. as refugees either attempted or carried out a terrorist attack – resulting in three deaths. And, of most relevance to President Donald Trump’s proposed immigration ban, all three of those killings were perpetrated by anti-Castro refugees. Resistance Report. 27 May 2017. The Intercept. 31 May 2017. Think Progress. 1 March 2017. Cato Institute. 13 September 2016. Associated Press. 29 March 2012. The Washington Post. 27 May 2017. The Guardian. 23 April 2015. Baltimore Sun. 21 May 2017. Legal Information Institute, Cornell University School of Law. Date of publication unknown. Public Intelligence. 10 November 2011. The New York Times. 23 March 2017. Office of the New York County District Attorney. 27 March 2017. National Consortium for the Study of Terrorism and Responses to Terrorism at the University of Maryland. February 2017.